Anger Management Books by William DeFoore, Ph.D. This is where you will find the anger management books to meet all of your needs. We have three books to offer you, each covering a different perspective that will serve you well. Let's start with the book that offers the most comprehensive step-by-step approach. You'll read stories about others who have faced and overcome their anger issues, along with helpful guides that you can use to reach your anger management goals. Learn how anger relates to depression, illness and grief, and how you can learn to face all of these challenges successfully. Master the art of effective communication, no matter what you're feeling, so that you can create lasting love relationships. Still here? Great! Let's take a closer look at what Anger: Deal With It, Heal With It, Stop It From Killing You has to offer you. Of all the anger management books out there, this one gives you a top-to-bottom, inside-out look at anger management. And much, much more! In these anger management books, you will read stories of real-life people like you, what their problems are and how they deal with them. "I'd like to ask everyone to read Dr. DeFoore's book, Anger. Then we would have healthy parents, couples who are able to compromise, and resilient selves." You will find all of the information you need in these powerful and effective anger management books designed to address all of your anger management needs. 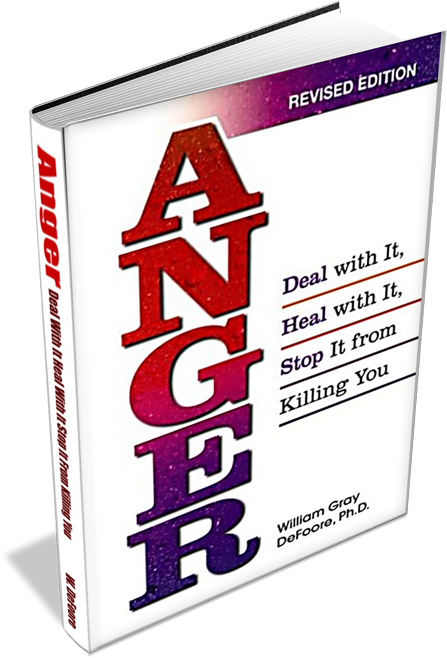 "In keeping with the times, Dr William DeFoore's revisions to Anger: Deal With It, Heal With It , Stop It From Killing You insightfully address the problems of today-anger in the schools, on the roads, in our children and at work. Behind every person's anger is a story. Dr. DeFoore can help us understand the stories and empower us to be a part of positive change in ourselves, our homes and in our communities." "This powerful new addition of Anger: Deal with It, Heal with It, Stop It From Killing You is for anyone who has felt hurt or seen others hurt by unhealthy anger. It is also for those who want to experience and communicate their anger in ways that allow them to gain a sense of personal strength, health and integrity, experience greater intimacy in relationships and attain deeper fulfillment in their lives at every level. It is for all of us wishing to rebuild a world with a safe and healthy future for ourselves and our children." You need anger management books that get to the heart of the matter, and provide an accurate, easy-to-follow roadmap to healing and recovery. That's what you will find in Dr. DeFoore's books. I was speaking at a conference on the topic of The Spirituality of Anger, and my publisher was one of the conference coordinators. The response to my talk on spirituality and anger was so positive, he asked me to write a book on the topic, and Anger Among Angels is the result. Of all the anger management books out there, this is the only one to look closely at the journey from warrior spirit to spiritual warrior, and how to make healthy anger a totally positive aspect of your life and existence. Discover true spiritual power in the meeting place between anger and love! Learn how healthy, spiritually focused anger can be the key to healing and personal transformation. Dr. DeFoore invites you on this journey to sacred space through the mystery and majesty of the human soul. In a series of short stories, he shows you the magnificence and power of the human capacity for love and compassion. Discover your own beauty and value in this surprising and inspiring book. You are someone who struggles with questions of good and evil, and would like to understand this realm better. Dr. DeFoore's approach is highly comprehensive and thorough, leaving "no stone unturned," and also leaving you with a sense of peace and acceptance of yourself and others. When you read this anger management book, you will just flat feel better about yourself, which will help you to make better decisions and manage your anger more successfully! 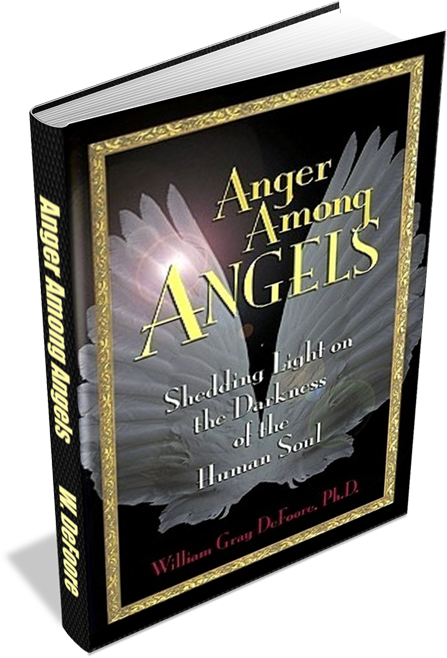 Anger Among Angels is one of the few anger management books that addresses the spiritual aspects of anger. If you have a story to tell, just go here and start typing your story, or read other visitors' stories here. These books are excellent for learning, improving relationships and personal growth. Reading anger management books will only take you so far however, and then it's time to take action! Check out these other excellent anger management resources! Of all of the anger management books you will read, this one will take you deeper into the mystery and majesty of who you are. Enjoy the journey of discovery that resides right there in your own heart and soul, the most important journey you'll ever take in your life! Here is your roadmap for inner healing. Your eyes and ears don't work for looking and listening inside--Serai gives you a story with characters that help you do just that! Now you can see into the internal world of your emotions, and you will love what you find! Right there inside you is healing power, magic, creativity and love beyond what you have ever known. Learn to love and accept yourself as you really are! Consider this a roadmap leading to the treasures of the inner realms of your being. Nothing is more valuable than knowing yourself, and having tools for self-acceptance and inner healing. This is how you become your own best anger management resource. 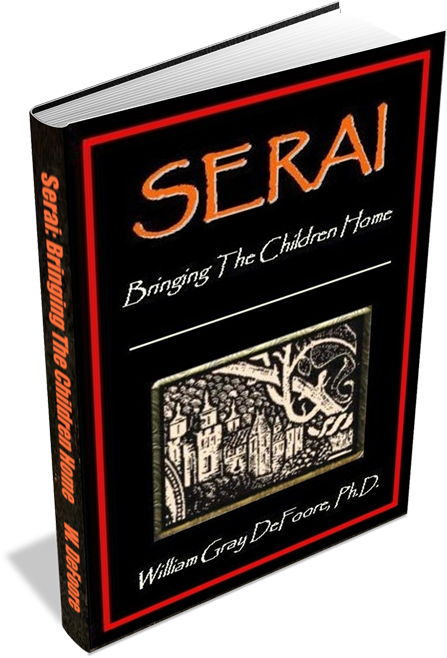 Here's what one of our enthusiastic readers said about Serai: Bringing The Children Home. "I've read Serai through twice now and started on a third time. Each time becomes more personally revealing and inspiring. The childlikeness of Serai is trustworthy and vibrant with colorful detail. It touches a lot of soul, real quick!" "Serai appeared at a point in my life where fear threatened to immobilize me. The courage of the main characters on their journeys to the underworld helped me to navigate my own inner journey, and to welcome back and heal parts of myself I had never known existed. " Stages Of Grief: Learn all about the phases and stages of grieving, and how to move through them and return to love, without getting stuck in anger, bitterness and depression. The Angry Girl: Sometimes dealing with angry girls can be different than dealing with boys. Learn the unique challenges this represents, whether you're a parent or an angry girl. Understand Teen Behavior: Understand where the anger comes from, and how it can affect behavior. Also find out how to encourage healthy teen behavior. Teen Violence: Get the answers on where violence comes from, and what you can do to keep your teens and your family safe. Parenting Teenagers: Get specific professional guidance for helping the difficult adolescents in your life to become the healthy, productive young people they really want to be.